Holocaust denial is now mainstream and legit! Final paragraph: „Prestate Israel” was, of course, Palestine. Hitler should be grateful to Mr.Headache-yahu and happy in the Hell. Anyone who read „Mein Kumf” will attest that Hitler was in fact bent on eliminating the Jewry, Husseini or not. Prime Minister Benjamin Netanyahu sparked public uproar when on Tuesday he claimed that the Mufti of Jerusalem, Haj Amin al-Husseini, was the one who planted the idea of the extermination of European Jewry in Adolf Hitler’s mind. The Nazi ruler, Netanyahu said, had no intention of killing the Jews, but only to expel them. Netanyahu’s remarks were quick to spark a social media storm, though Netanyahu made a similar claim during a Knesset speech in 2012, where he described the Husseini as „one of the leading architects” of the final solution. The argument concerning Husseini’s role was recently mentioned in a book by Barry Rubin and Wolfgang G. Schwanitz, „Nazis, Islamists, and the Making of the Modern Middle East.” The authors, like Netanyahu, draw a straight line between the mufti’s support of Hitler and the policy of the Palestinian Liberation Organization under Yasser Arafat. But even these two researchers do not claim that the dialogue described by Netanyahu ever took place. They say Hitler reached the conclusion to exterminate the Jews because of his desire to nurture Husseini, who opposed the transfer of Jews to pre-state Israel. 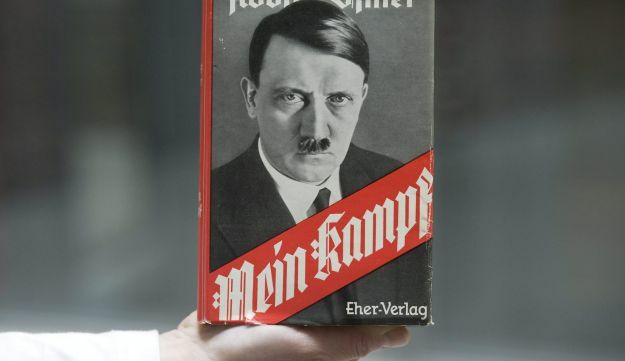 Although much of Adolf Hitler’s political manifesto, ‚Mein Kampf,’ was devoted to explaining that hatred, researchers have looked for a more personal explanation. One cant consider the Holocaust without wondering about the source of Adolf Hitlers hatred for the Jews. Although much of his political manifesto, Mein Kampf, was devoted to explaining that hatred, which was clearly shared by an enthusiastic German nation, the actions taken against Europes Jews were so monstrous in both nature and scale that it was inevitable that researchers would look for a more personal explanation. Its natural that scholars and others would scrutinize every piece of available evidence for proof of some deeply personal psychological injury that will explain Hitler. Even before Hitler came to power, there were rumors that he was of Jewish descent, a detail of personal history that would be highly damaging, even humiliating to him, and which he went to lengths to quash. The idea derived from the fact – not a secret – that his father, Alois Hitler, was illegitimate. Although Hitlers paternal grandmother, Maria Anna Schicklgruber, eventually married Johann Georg Hiedler and took his surname, Alois was already aged five when she did so, and she never did reveal, if indeed she knew, who his father was. Naturally, there was much speculation about the identity of Hitlers grandfather – most of it centered on Johann Georg Hiedler himself and his brother, Johann Nepomuk Hiedler, who was the stepfather of Alois, and who left him part of his estate when he died. The Jewish angle to the speculation, however, concerned a third candidate, a Jew named Leopold Frankenberg, who according to Hitlers personal lawyer, Hans Frank, was the young-adult son of a couple who employed Maria Schicklgruber as a cook at the time she became pregnant with Alois. According to testimony given by Hans Frank at the Nuremberg Trials, in 1945-46, he had heard from Hitler himself in 1930 about this Jewish ancestry. Nevertheless, no evidence has ever been found to support this claim, nor is there any proof that Leopold Frankenberger even existed. In any event, the connection between having an embarrassing ancestor in ones family tree to possessing a pathological hatred of that ancestors ethnic group is far from obvious. Another well-known theory concerns the Jewish physician, Eduard Bloch, who cared for Hitlers beloved mother, Klara Hitler, before her death from breast cancer, in 1907, at age 47. By the time Klaras condition was diagnosed, it was incurable, but Dr. Bloch, at her sons insistence, treated her for more than a month with a quasi-experimental medication called iodoform. The medication caused her excruciating pain, but did not extend her life. Could the Holocaust have been Hitlers revenge on Dr. Bloch for his inability to save Klaras life? Certainly at the conscious level, Hitler did not hold Bloch responsible for his mothers suffering. After her death, he actually wrote to Dr. Bloch thanking him for his devoted care. Three decades later, in post-Anschluss Austria in 1938, when Bloch wrote to the chancellor asking for help, Hitler arranged for him to be spared the harsh measures being taken against Jews until he could make arrangements to emigrate to the United States, where he died in 1945. Last fall, Israels prime minister suggested that Hitler got the idea for the Holocaust from the Palestinian political and religious leader Amin al-Husseini, who was the grand mufti of Jerusalem from 1921 to 1937. According to Benjamin Netanyahu, Hitler would have sufficed with expelling the Jews from Germany, but Husseini complained that if he did that, they would just come to Palestine. When Hitler asked Husseini what he recommended, said Netanyahu, the Arab counseled him to burn them. Netanyahus theory was not widely embraced, to put it mildly, and he himself soon backtracked on it, conceding that, responsibility of Hitler and the Nazis for the extermination of 6 million Jews is clear to fair-minded people. In Mein Kampf, published in two volumes, in 1925 and 1926, Hitler himself explains that he had no special feelings about Jews before he moved to Vienna, in 1908, and that even then, initially, he thought favorably of them. He saw the light only after Germanys loss in World War I, for which he held the Jews responsible. During the second half of the 19th century, as the Jews emancipation throughout most of Europe led to their increasing integration into society and into the modern economy, it elicited a backlash. Anti-Semitism, some of it murderous, rose across the continent, including in Germany. When the Jews were kept apart in the ghetto, and limited to certain professions, it was possible to accuse them of clannishness, and resent the interest they charged on loans. But when they emerged from the ghetto, and became captains of industry and finance, and socially and intellectually prominent, there was a whole new set of reasons to hate them. The success of the emancipated Jews was perhaps even more galling than the poverty and degradation of disenfranchised Jews – and it gave rise to racial theories that posited an essential biological difference in them. When imperial Germany went down to defeat in 1918, and Kaiser Wilhelm, the German emperor, was forced to abdicate, a popular theory that Germany had been stabbed in the back by the Jews took hold. Jews role, on the one hand, in the socialist and Communist movements that led revolutions in both Germany and Russia, and their prominence in international finance, on the other, led to dark theories about Jews lack of national loyalty, their treachery, and their degeneracy. In Hitlers mind, all the groups that he saw as foiling Germany – Bolsheviks, socialists, social democrats – became identified with Jews, because indeed, Jews were so prominently represented among each of them. His political theories blended with increasingly technical racial theories that imagined the Jews, along with other groups like Slavs and Gypsies, as biologically inferior to Aryans, the white northern European race that pure Germans were presumed to belong to. However perverted his thinking and outrageous his theories, though, and whatever personal experiences he did have that may have turned him against Jews, Hitler was supported at every level of German society by people who were ready to see their country return to the greatness they felt had been denied it, and to believe that it was the Jews who were responsible for that fall from grace. This entry was posted in Dzieje, Genetyka, Tradycje i kultury, Zakazana Wiedza, Ściemy na masę, Życzenia pobożne and tagged #GermanDeathCamps, #JewishCollaborationWithNaziGermany, #JewishNaziCollaborators, #PolishHolocaust, #PolishHolokaust, 13 Leszno, 13 Leszno Street in Warsaw, Abraham Gancwajch, Adam Czerniakow, Adolf Hitler, Adolf Hitler's mind, and the Law: A Quest for Justice in a Post-Holocaust World, Ans van Dijk, Auschwitz, ‎ Rachel Neiman, Bernard Goldstein, Birkenau, Central Office of the Jewish Council of Elders in East Upper Silesia, Chaim Rumkowski, Chełmno extermination camp, Collaboration with Occupying Forces and Genocide in the Second Republic 1918-1947, David Gutter, David M. Crowe, denial, double ethics, double morality, double standards, Eichmann in Jerusalem, Elsa Trank, Else Tarnek, Enemies Within Our Camp- The Trial of a Kapo, extermination of European Jewry, Five Years in the Warsaw Ghetto: The Stars Bear Witness, Genocide, German, German Gestapo, German Jewish, German occupied territories, ghettos in Nazi-occupied Europe, Give Me Your Children, Gross-Rosen concentration camp, Gross-Rosen concentration camp in Germany, Group 13, Group Thirteen, Guttman Shmuel Landau, Haaretz, Haj Amin al-Husseini, Hannah Arendt, Hashomer Hatzair, HItler, Hitler only wanted to expel the Jews, Holocaust, Holocaust Industry, Holocaust scholar, http://jewishcrimes.info, https://www.haaretz.com, Hungary, Ignacy Diamond, II World War, Itamar Levin, Jacob Gens, Jakub Lejkin, Józef Andrzej Szeryński, Jerusalem's Grand Mufti, Jewish Aid and Rescue Committee in Budapest, Jewish collaboration with Nazis Germany, Jewish collaboration with Nazis Germany during II World War, Jewish Community of Vienna, Jewish council, Jewish ethics, Jewish Gestapo, Jewish Ghetto Police, Jewish ghettos in German-occupied Poland, Jewish Holocaust Amnesia, Jewish honor, Jewish kapos, Jewish Nazi collaborators, Jewish self-agency, Jewish Sonderkommando, Jews Accusing Jews, Jews were put on trial in Israel for aiding the Nazis, Josef Löwenherz, Josef Szynkman, Judenrat, Kapo on Allenby, kapos, Katarzyna Person, Kurt Becher, Leon Rosenblatt, Litzmannstadt, Litzmannstadt Ghetto, Man’s Search for Meaning, Marcel Zellinger, Mein Kampf, Mordechai Chaim Rumkowski, Mordechai Goldstein, Moshe Merin, Moshe Pochich, Nazi and Nazi Collaborators (Punishment) Law, Nazi and Nazi Collaborators Law, Nazi collaborator in the Warsaw Ghetto, Nazi concentration camps for Poles in Silesia, Nazi German administration, Nazi-imposed Jewish councils, Nazi-imposed Judenrat, Netanyahu: Hitler Didn't Want to Exterminate the Jews, Norman G. Finkelstein, Ofer Aderet, Oskar Schindler: The Untold Account of His Life Wartime Activities and the True Story Behind the List, Ostrovitz ghetto, Poland, Poland’s Holocaust: Ethnic Strife, Poles, Polish citizens, Primo Levi, Restoring ‘Jewish honor’, Reya Hanes, Rudolf Kastner, Schindler’s Ark, Schindler’s List, Shoah, smuggling furs out of the Warsaw Ghetto, Sonderkommando, Stella Kubler, Symche Spira, Szlojme Hercberg, Szymon Spitz, Tadeusz Piotrowski, Talmudic ethics, The Drowned and the Saved, The Holocaust Industry: Reflections on the Exploitation of Jewish Suffering, The Nazi collaborator who served ice cream in Tel Aviv, Thomas Keneally, Tzvi Yaakovson, Viktor Frankl, Walls Around: The Plunder of Warsaw Jewry during World War II and Its Aftermath, Warsaw Ghetto, Wehrmacht, Weronika Grynberg, Wiera Gran Vera, Wladyslaw Szpilman, World War II, World Zionist Congress in Jerusalem, Yaakov Honigman, Yechezkel Ingster, Yehezkel Ingster, Zentrale der Jüdische Ältestenräte Ostoberschlesien by SKRiBHa. Bookmark the permalink. pierwszy fundusz pomocy Żydom powstał w USA dopiero w 1946, już po wojnie. Ci sami ludzie chcą dziś okraść Polskę na 65 do 300 mld USD. Nic im się nie należy, poza wieczną hańbą. Amerykanscy Zydzi nie ruszyli palcem, by ratowac swoich rodakow. Dzieki temu nie tylko nie stracili swych fortun, ale dzis domagaja sie od Polski jeszcze wiekszych fortun. To sa po prostu Zydzi. I dlatego to amerykańscy Żydzi mają taką jazdę na Polskę. Wiedzieli, nie zrobili nic i nie chcą by ktoś im o tym przypominał. Żenująca hipokryzja. Żydzi z Ameryki wiedzieli i zdradzili i skazali na śmierć Żydów z Europy.Ówczesny prezydent Ameryki nic nie zrobił aby ratować Żydów z Europy.Teraz Żydzi z Ameryki niech odczepią się od Polski. — mówił w wywiadzie dla „Dziennika Gazety Prawnej” Sławomir Grünberg – reżyser filmu „Karski i władcy ludzkości”. Film Grünberga opowiada o bierności wielkich przywódców światowych wobec przerażających informacji o zagładzie Żydów, które przekazywał właśnie Karski. Jak zaznaczył rozmówca „DGP”, choć Żydzi 70 lat temu nie mieli swojego państwa, czy też swojego przedstawiciela na świecie, to taką rolę przyjął właśnie Karski. Taki wywiad przetłumaczyć na języki obce i puścić to w świat! Było jeszcze takie powiedzenie, że w Palestynie jedna krowa była więcej warta niż 5 Żydów w okupowanej Polsce! Ostatni świadkowie wydarzeń odchodzą i za chwilę nikt z żyjących nie opowie jak to było naprawdę! http://gosc.pl/doc/1523067.Niechciany-statek. Na podstawie tej historii nakręcono także film ,,Rejs wyklętych”. Przecież od czasów Mojżesza wiadomo że Żydzi tylko wierzą w złotego Cielca. Żmijowe plemie nigdy się nie przyzna do mordowania rodaków, a Jedwabne i Kielce trzeba na nowo wyjaśnić i ujawnić. Holokaust to maszynka do pieniędzy u żydów., przedsiębiorstwo. Żmijowe plemie nie ratowało swoich braci a ładowali ich do krematoriów, filmy pokazują żydowskie kapo jak bije żydów w obozach. Holokaust to był ale na Polakach których najwięcej zginęło. hańba żydom po wsze czasy. co za podły naród. Żydzi nie chcą nie potrzebują i panicznie boję się prawdy. ale dolary były dla nich ważniejsze niż życie polskich Żydów. Myśmy ryzykowali własnym życiem i życiem bliskich, by pomóc obcym nam ludziom, oni nie byli gotowi nawet sięgnąć do kieszeni.